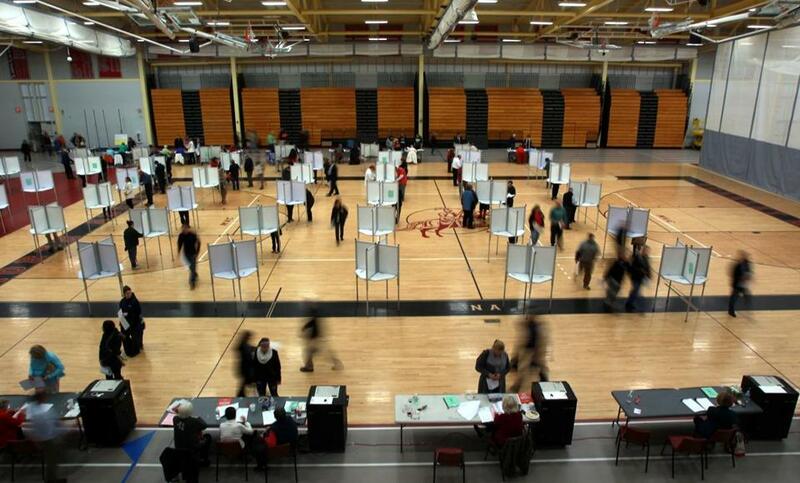 Residents turned out to vote at the high school in North Andover, one of the towns that Charlie Baker carried. By 10 p.m. on Election Day, a prediction by political science professor Michael Kryzanek that Democrat Martha Coakley would win the gubernatorial race by about 1,000 votes seemed right on the money. But just an hour later, when results from South Shore suburbs started coming in, Republican Charlie Baker had the lead by about 8,000 votes. With voter turnout in Boston and other large cities such as Worcester down from 2010, when Baker lost to incumbent Governor Deval Patrick by 6.5 percentage points, suburban communities had a stronger influence, and pushed Baker to victory this time around, said Mary McHugh, adjunct professor of American politics at Merrimack College. This time Baker improved his gains not only in conservative-leaning towns, particularly south of Boston, but also in smaller cities considered Democratic strongholds such as Newton and Salem, where he lost to Coakley but still garnered more votes than he did in 2010. With 58 percent of the vote, Coakley trounced Baker in Newton, but his 37 percent showing there was 8 points higher than in 2010. In Salem, Baker improved by 5 points to 42 percent . Campaigning as a moderate Republican, Baker appealed to independents, who make up the majority of registered voters in Greater Boston suburbs. Matt Fenlon, executive director of the Massachusetts Democratic Party, said Coakley had grass-roots momentum in every community, and counted 6,300 volunteers on Election Day who knocked on more than 400,000 doors and called 700,000 voters. Representatives from the Massachusetts Republican Party did not return a request for comment. Wellesley was among the communities that Baker lost in 2010 but won on Tuesday. Potentially helping his chances there was the state treasurer’s race between local Republican Michael Heffernan and Democrat Deborah Goldberg, said Susan Ryan, cochairwoman of the Wellesley Democratic Town Committee. Although Heffernan lost to Goldberg, he is well known in Wellesley, where he won, and could have influenced voters to back Baker, she said. South of Boston, Baker managed to win in both Milton and Quincy, where he had lost to Patrick in 2010. He squeaked by with a 1-point advantage over Coakley in Milton, and won by 5 percentage points in Quincy. Dyck pointed out that Quincy’s voter turnout was 4,000 fewer than in 2010. In Newburyport, where Baker lost with 42 percent of the vote in 2010, but won with 49 percent on Tuesday, Charles Tontar, chairman of the Newburyport Democratic City Committee, said Republicans were much more organized locally than they were a few years ago at getting out the vote.